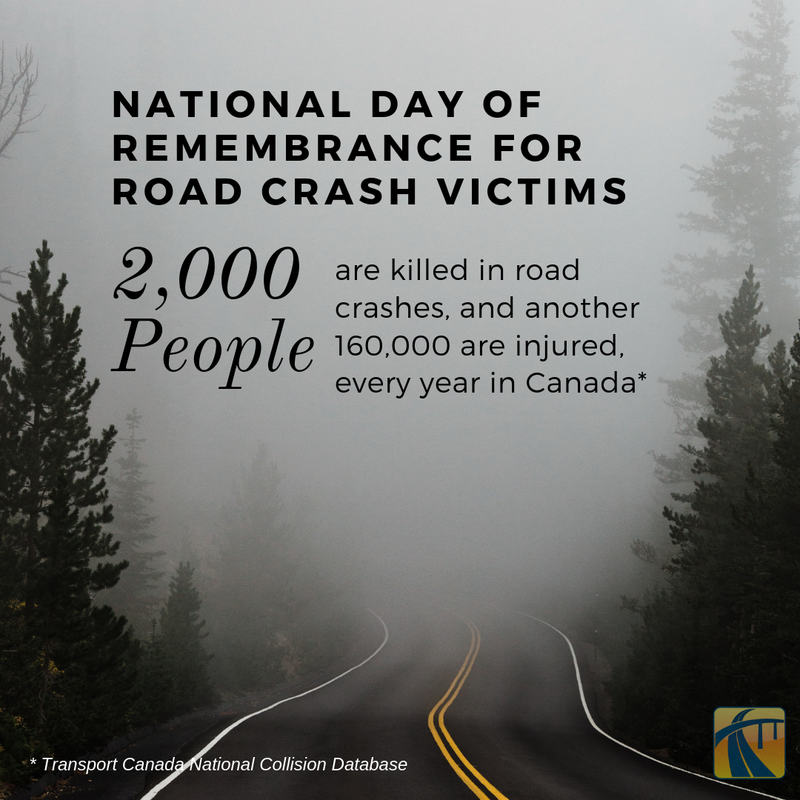 Today (Nov. 21) is National Day of Remembrance for Road Crash Victims in Canada– a day set aside to remember those killed or seriously injured on Canadian roads. It’s also a time to consider the victims’ friends and families who are left struggling with the sudden loss of people they love. We choose not to use the word “accident” because these crashes are more often than not avoidable. Our number one priority here at the Ministry of Transportation and Infrastructure is to help people travel safely. Campaigns such as Shift into Winter and Cone Zone BC highlight the responsibilities we take on whenever we get behind the wheel. And our traveller information system, DriveBC, provides valuable insight into road conditions and events, so you can make educated decisions about travelling. According to Transport Canada, about 2,000 people are killed in road crashes, and another 160,000 are injured every year in Canada. Alcohol, drugs, speeding, driver distraction, not driving to conditions, fatigue and failure to buckle up are key contributing factors in collisions. Road safety is a shared responsibility and each of us can take action to make our roads safer. Using a handheld device while driving is against the law in British Columbia, so please LEAVE THE PHONE ALONE on the road; your primary focus while behind the wheel should always be on what is ahead of you. Driving while under the influence is, as always, strictly prohibited by law and under enforcement. Speed limits are for IDEAL road conditions. Please adjust your speed accordingly. By remembering those people affected by road crashes, we are in a better mindset to take on the responsibilities of safe driving practices. Very important and necessary information, thank you. As I DO drive the speed limit or adjust speed to adverse conditions, most other drivers hate me for it! Nevertheless, safe driving has given me 40 years of accident-free driving – and providing me time and room to compensate for other drivers’ negligence. Just a suggestion: it would be lovely to have the weather forecast broken down for each of the more dangerous roads, and have it directly accessible right by the cams, so one can plan better on when to travel. Hello Ronel and thank you for your informative comment. We will share your suggestion with our webcam folks for review.